--the commissioners have some interest in issues like affordable housing and jobs, which are out of their purview, but they don’t know very much about them, and staff didn't help too much. It made for a major contrast with the launch of BrooklynSpeaks, which, despite some questionable aspects, still provides more informed criticism than did those trusted to serve the city. The recommendations must first be ratified by the commission and memorialized in a letter that will be discussed at the commission’s meeting Wednesday. But it was hardly a contentious debate; after all, the plan for an eight percent scaleback was said to be under discussion by the developer earlier this month. A reduction of 700,000 square feet could mean the reduction of as many as 700 market-rate units, bringing the number of condos down from 2360 to 1660. Then again, there also could be a reduction in the number of rental units, currently planned at 4500, with half of them designated as affordable. Why’s DCP involved in the first place? A Memorandum of Understanding requires the ESDC to consult with DCP concerning the override of zoning and other local regulations, though it's unclear what power the city agency actually has. Brooklyn's representative on the CPC, Dolly Williams, didn't participate. She's recused herself because she's an investor in the Nets. The review session got off to an inauspicious start as Regina Myer, director of the DCP’s Brooklyn office, described the project as “incredibly transit-oriented,” on “primarily state-owned land,” and located “in Downtown Brooklyn,” all highly debatable assertions that got some in the crowd muttering, including James—who represents the Prospect Heights project location. Reflecting commission chair Amanda Burden’s concern that there be storefronts along Atlantic Avenue near the planned arena, Myer described a “b-market,” a narrow strip of retail to accommodate smaller shops. While buildings along Atlantic Avenue would be tallest, there would be “a dramatic stepdown to Dean Street, which is the northern edge of Prospect Heights,” she said. (Many would say that Pacific Street, one block north and bordering the MTA’s Vanderbilt Yard, is the northern edge.) Such an adjustment had already been announced in May. Myer described the use of curvilinear, fragmented, and traditional forms, which, she suggested, would “start to break down the bulk” of the project. However, she declared that the building has “too wide a shoulder base,” which, sounding like a term out of couture, means its middle-section—240 feet across Atlantic Avenue—needs to become slinkier. The building at Site 5 (below), in the block bounded by Fourth and Flatbush Avenues and Pacific Street, would be cut from 350 feet to 250 feet “to provide a better transition.” (This was And Building 6, the middle of three buildings over the railyard between 6th and Carlton avenues (and built in Phase 2), would be reduced from 334 to 220 feet, thus making “a tremendous difference in terms of variety,” according to Myer. DCP also recommended that open space be increased from seven acres to eight acres by reconfiguring it. That still doesn’t address the significant deficit in the open space ratio, given an enormous incoming population. When the commissioners got a chance to ask questions, they were curious, if not always well informed. Commissioner Angela Battaglia asked about displacement caused by the project. Myer turned the floor over to the ESDC’s Rachel Shatz, Director, Planning and Environmental Review, who gave a defensible but narrow reply. She said that the state Eminent Domain Procedure Law required a relocation plan for anyone who had to move. But she didn’t mention the contentious issue of displacement in the area around the project, a phenomenon the DEIS discounts. Commissioner Irwin Cantor asked about the evolution of the project, saying that the original proposal was “significantly more modest” before it grew. Myer gave a technical answer focusing on the configuration of buildings: the number of towers around the arena had grown from three to four, and Site 5 was added at a later date. She didn’t explain that the project was originally proposed at about 8 million square feet, was increased to 9.132 million square feet, and was cut to 8.659 million square feet. 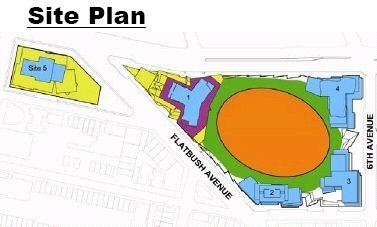 An 8 percent reduction would bring Atlantic Yards just below its starting point, to 7.959 million square feet. How long would the affordable housing last, asked Commissioner Kenneth Knuckles. Thirty years, the term of the bonds, said Rafael Cestero, Deputy Commissioner for Development at the Department of Housing Preservation & Development (HPD). Knuckles asked how many jobs would be created. Myer responded that there would be 15,000 construction jobs, though actually there would be 1500 jobs a year over ten years. Knuckles wanted to know about jobs directed to the local community. (He apparently hadn’t heard of the Community Benefits Agreement.) Shatz said that was an issue between Forest City Ratner and the CBA signatories, so she couldn’t speak to that. Her non-answer seemed to buttress the argument, as some politicians have made, for formally incorporating this side agreement into a governmental process. And what about the permanent jobs? There are numbers in the DEIS, but Shatz passed and Cori Packard of the New York City Economic Development Corporation (EDC) was called to the podium. She cited a June 2005 document (p. 6) that projected 7100 office jobs. However, the amount of planned office space has since been cut by two-thirds, but no one saw fit to point that out. Commissioner Richard Eaddy asked about the minimum number of affordable units. Cestero said that 30 percent of all the units in Phase 1—600 units—would be affordable. That suggests 600 affordable rentals, 600 market rate rentals, and 800 market-rate condos. That would be a distinct contrast from what’s suggested in the DEIS: 404 affordable rentals, 404 market-rate rentals, and 1542 market-rate condos. In essence, that’s a total reduction from 1946 market-rate units to 1400 market-rate units. “We don’t know if it’ll be 4500 [rentals] or 4300,” he said, since the project reduction isn’t complete. He said that Phase 1 would include 1200 rentals, with half of them affordable. Projections in the DEIS said there would be only 808 rentals. Is there a commitment for completing Phase 2 in a certain time, asked Commissioner Jane Gol. “There is no commitment on the time,” Cestero replied. In other words, depending on market forces and other factors, the majority of the affordable housing and the open space may not be completed by 2016 as currently billed. How do we get the 2250 affordable units, asked Commissioner Angela Cavaluzzi, pointing to a document that indicated “approximately 2250” units. Cestero gave a slightly different description of the funding agreement, saying that it would be memorialized in a document HPD would sign with the EDC regarding infrastructure. “We have a commitment for 30% of the units in Phase 1, and will seek the balance in Phase 2,” Cestero said. What kind of parking and transit improvements would there be? Shatz mentioned the reconfiguration of Fourth Avenue, the use of remote parking and shuttles, the potential to offer a 50% MetroCard discount, and the extension of rush hour schedules later into the night—mainly mitigations that the Tri-State Transportation Campaign has found wanting. There was a question about the “intergenerational facility,” which Winston Von Engel, Deputy Director of DCP’s Brooklyn office, explained as a mixed senior center and day care center. He noted that it was a project that Forest City Ratner had agreed to in the CBA. There were lingering questions about the size of the facility, but nobody pointed out that 100 day care slots would make a tiny dent in a new population of more than 15,000. DDDB's Goldstein observed, "Three years into it, it was clear that the planning commission didn't know much about this project. It's been Forest City Ratner's project, which violates Kelo." He was referring to the Supreme Court case which said that the exercise of eminent domain for economic development was justified only if it was derived from a municipally-approved plan. Whether Atlantic Yards does in fact violate Kelo will likely be tested in court.